What Songs Should Ken and Lisa Do At Pennsic 2015? We need your help putting together a set list for the Ken and Lisa Theriot concert at Pennsic, 2015 – Tuesday, August 4th at 9:00 pm at the Performing Arts Pavilion. 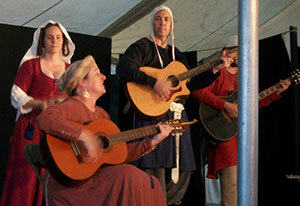 So if you plan or hope to be at Pennsic in August, and will be at the concert, please let us know – via that handy comments section below – which of Ken’s and Lisa’s songs you would like to be sure will make it onto the set list. That will help us out greatly.